Lego Education, the more serious branch of the Lego enterprise, aims to provide teachers and other education providers with fun ways to engage children with science, technology, engineering and maths (Stem) subjects. To us, it may just be a toy we have long left in our childhood, but the makers at Lego Education are creating ways these tiny bricks can support and encourage schools and teachers to make Stem more interesting in a learning environment. The idea is the kids are learning more about technology, science and engineering without really knowing they’re doing it. 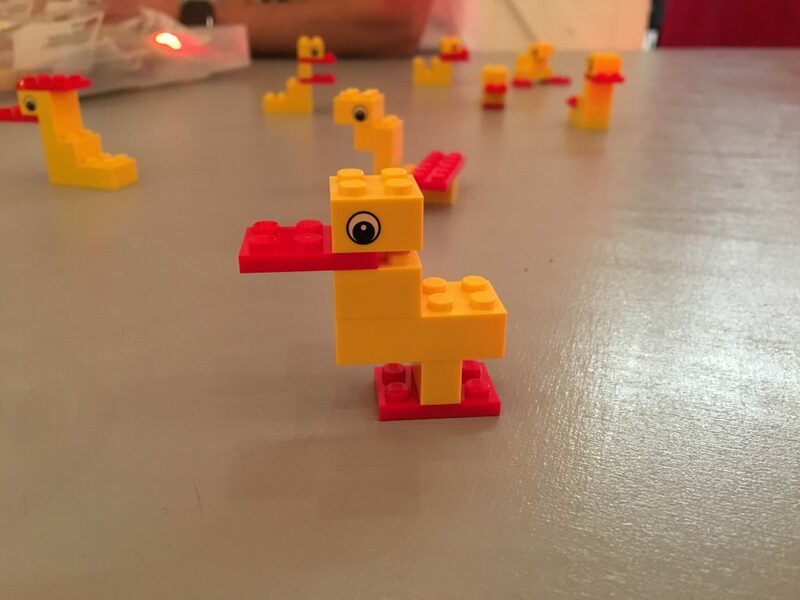 The Lego Education journey, for many, begins four yellow bricks, two red bricks and the instruction to make a duck. I liked to think of the duck as a sort of thought experiment – there is apparently “no wrong answer” when trying to make the duck, and there are many many different ways of solving it. Ethan Danahy, research assistant professor at Tufts University, accused our group of being “too polite” and claimed most people usually jump straight in. The advantage of adding this factor into a classroom is that it encourages some of the quieter children to be more involved in their learning experience rather than feeling like learning is “something that is done to them”. His argument was that by using tools such as Lego in the classroom, the children move from this passive attitude towards actively participating in their learning experience. 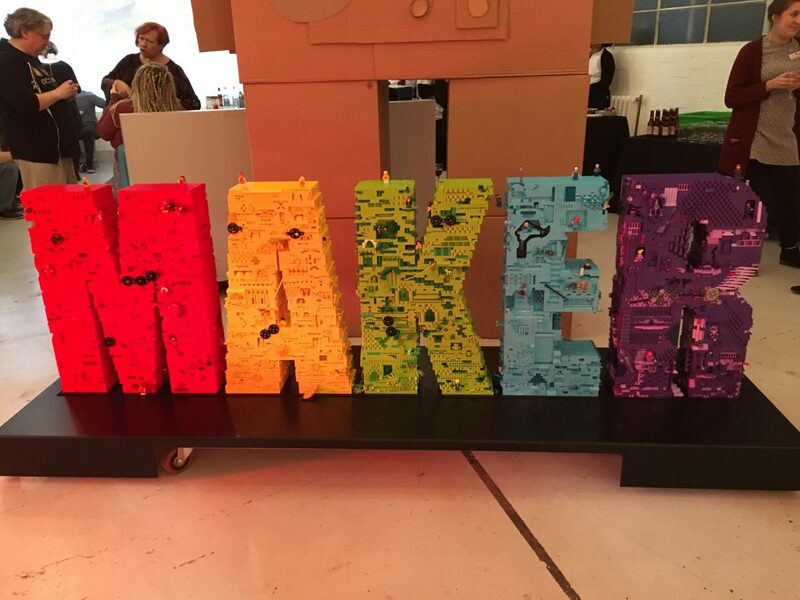 With automation making softer skills increasingly important, there is a focus on trying to encourage creativity by incorporating art into the science, technology, engineering and maths (Stem) focussed fields – in the Lego world it is referred to as Steam. Many use Lego in the classroom to promote creative thinking, and Jane Meldgaard Johansen, communication manager at Lego Education, claimed it is a good way to get children incorporating technology concepts into their learning whilst thinking outside of the box. Johansen had a number of examples demonstrating some extremely out of the box ideas children had produced – at one point she held something up and asked “what is this?”. Apparently after being tasked with making a wearable a child had produced a portable duster-and-fan combo ideal for keeping cool and helping his mum clean – a contraption made up of a Lego motor with feathers and an egg box. As part of the process children are asked to stand up and present their wearables and why/how they made them. Many of the children explain how they tested ideas before realising they didn’t work, adapting their inventions to make them better. Without even realising it, Johansen explained, the kids are taking part in an agile development process which she called “early scrum”. But while kids might be excited to play with Lego during lessons and surreptitiously learn about computing concepts, teachers can still often be far from comfortable bringing these technologies into lessons. 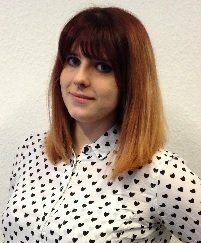 Catrine Bjerrehus, associate marketing manager for Lego MINDSTORMS at Lego Education, admitted to feeling out of her depth when she first joined the Lego world. To try and ease teachers into being more accepting of using Lego to support the curriculum in the classroom, there are resources available including cards with suggestions on how teachers can guide a lesson. All of the Lego Education sets designed for Primary and Secondary level education also come with a free downloadable guide which includes resources aligned with the curriculum to help teachers with building instructions and classroom tasks. I was introduced by Bjerrehus to some Lego Mindstorms equipment with an EV3 receiver, a type of technology aimed at students in secondary education (aged 10 years and above) that allows pupils to build and programme robots. I decided to latch on to another person’s project, helping her to code whatever contraption she created. 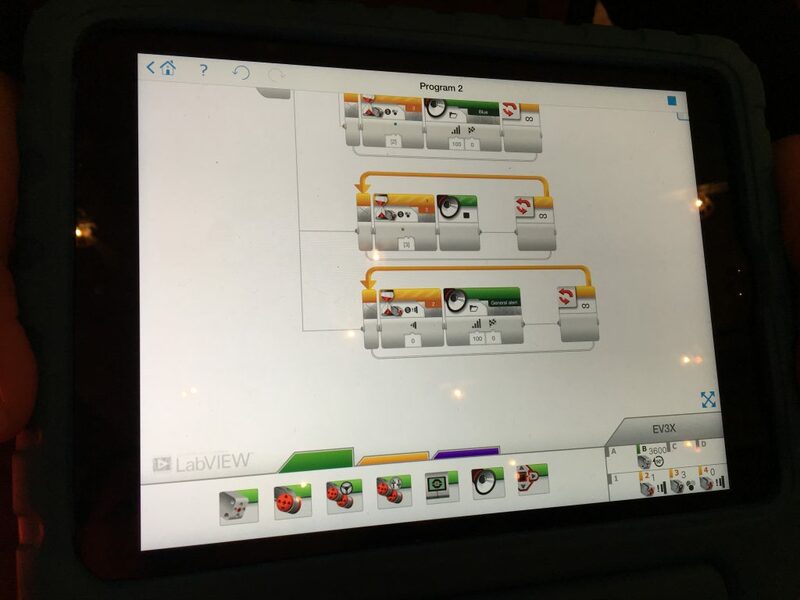 Whilst surrounded by Lego-powered egg carton dinosaurs, I used the drag and drop EV3 programming app to develop a string of instructions for our robot, which my partner decided was a lady bird. Though I didn’t have to develop any code for the robot, there were elements of coding and computational thinking involved in developing the robot’s instructions, and there was a mathematical element in trying to work out what direction the robot would go, what degree the robot would turn by and how fast it would go. 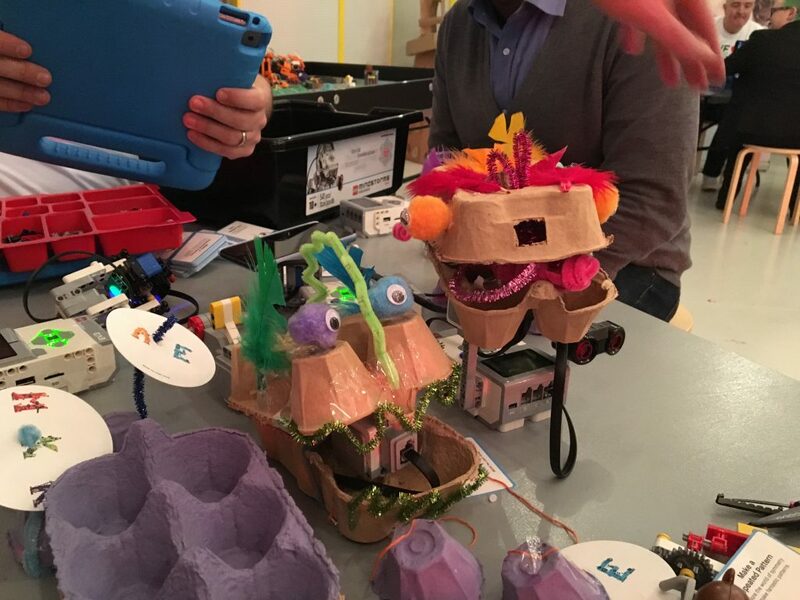 Bjerrehus claimed these technologies can be used for “all sorts of Steam lessons” to help students to understand these basic concepts whilst making these discoveries for themselves – again putting the emphasis on actively participating in classroom learning. The robot didn’t work as we expected and we eventually moved along. Helping children to make discoveries on their own through assisted play can be slightly more delicate for younger children, so for pre-school stage children aged three and up, Lego Education recommends LEGO Education STEAM Park sets. Children are challenged to use the pieces to build a theme park, and asked what will happen when particular pieces are used together. This introduces concepts such as balance, centrifugal force, pivots, and other mathematical and scientific theories that will keep occurring throughout their education. Rikke Baunbæk Wallington, senior concept and design lead for preschool, at Lego Education said she uses these in pre-school lessons filled with 40 children every day, and assured me can contribute to the Early Years Foundation Stage (EYFS) learning standards followed by all Ofsted-registered schools or early years providers in the UK. When moving on to primary learning, the recommended Lego kit for supporting classroom learning is the WeDo 2.0, a kit that pairs with the WeDo 2.0 software application to allow children to develop moving robotics. Though this kit is meant to be used to teach children aged seven and up, John Pinkney, Learning Adviser at Warwickshire ICT Development Servicer, claimed he has sometimes used it with sixth formers to make them more engaged in lessons. Most teachers already feel like they don’t have the skills to properly teach computing, and children who have grown up using technology can often make teachers feel like the kids know more than they do, making many apprehensive about introducing new methods into a classroom. “Some teachers are fearful,” Pinkey claimed, but explained the benefit of introducing play into the classroom is that the teachers can build and discover at the same pace as the children before the coding element is introduced. Once they have done this, “the blank canvas has disappeared” he said, giving teachers a bit more confidence because there’s something solid to work with. Developing the ability to think outside of the box, something Lego encourages, is important as children in schools now will grow up to have jobs that do not currently exist. Long-lasting stereotypes mean Stem subjects often appeal more to boys than to girls, and girls can be put off of contributing in these lessons. But by introducing a fun and accessible element to these subjects, these barriers can be tackled. Pinkey called the diversity gap in Steam industries “embarrassing” but hoped the dial would begin to shift as initiatives such as Stemettes, Apps4Good and Code Club prevail. After my Lego Education Graduation I spotted the robot I had been helping with earlier, now fully mobilised and whizzing across the room as people cheered – I couldn’t help but smile at my own part in the agile development process of the cheerful egg-box gadget. Do you have a large-scale AWS deployment?